The 2019 GMC Acadia, the latest midsize SUV on offer from GMC, is the pinnacle of stylish sophistication and optimal performance capability. GMC has the reputation and experience that makes it one of the leading brands in the industry, and the 2019 GMC Acadia, with its high-tech features, premium affordability, and luxury interior, brings GMC’s reputation as an auto manufacturer that much farther into the forefront. The 2019 GMC Acadia is a full-sized SUV with plenty of seating for both friends and family and has the stylish and sophisticated exterior you’ll want to show off around town. Top-of-the-line safety technology makes it a vehicle you can rely on, and the performance and fuel efficiency will always keep you running smoothly. 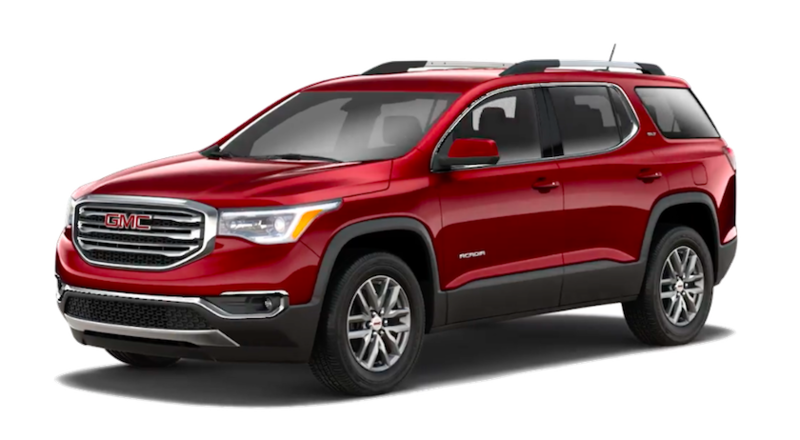 If buying a new SUV is in your future, take a look at the new 2019 GMC Acadia today at Carl Black Kennesaw, we’re positive you’ll find everything you’re looking for in this new premium, midsize SUV and more. When it comes to the interior of family vehicles, GMC knows comfortability and spaciousness is a top priority for car buyers, which is why the new 2019 GMC Acadia is at the head of its class when it comes to seating, space, and luxury features. The 2019 GMC Acadia seats a spacious seven and includes smart slide seats, so you can effortlessly guide the seats forward and back, letting passengers easily maneuver when getting in and out of the vehicle. In addition, if having plenty of space for groceries, sports gear, or those long family vacations is on your checklist, then the 2019 GMC Acadia has you covered. This new GMC SUV features center console storage, a second row rear storage drawer, under-floor cargo area storage, and folded second and third-row seats enabling a spectacular 79 cubic feet of storage. Whether you’re moving to a new house or taking your children to their next sports event, this is a car that has the space and the seating to ensure that everyone is safe and comfortable. Let’s not forget about style either. Space is important, but GMC also wants their customers to feel like they’re in a high-class luxury vehicle, which is why the 2019 GMC Acadia is available with All-Terrain leather comfort seating, active noise cancellation for a quieter cabin, wood and chrome accents, French-stitched seats, ambient lighting, and intuitive control features to name just a few of the great perks this vehicle has to offer. Ever get tired of people being too hot in the front and too cold in the back? Those days are long gone with this new SUV, which is available with dual climate zone systems so everyone can control their own air and temperature at any time. With an eye towards space and comfort, the 2019 GMC Acadia is the best of the best when it comes to family vehicles. Safety features are getting better and better every year and GMC doesn’t skimp when it comes to the 2019 GMC Acadia. Onboard this high-tech SUV, drivers will be more than satisfied with its standard and available safety features. Safety is one of the most important features when deciding on a new car, and GMC includes the latest and greatest safety technology in their new SUV. The 2019 GMC Acadia includes such high-tech safety features like a lane change alert system with side blind zone alert which alerts you to cars in your blind spot via a lighted signal on the side mirrors. Available rear cross traffic alert which alerts you to oncoming vehicles on your left or right when you’re reversing out of a parking space. Available rear park assist which helps the driver park and avoid any nearby objects, a rear vision camera system, as well as Teen Driver system that encourages safe driving habits in new drivers and even includes an in-vehicle report card. This report card keeps you up to date on potential driving skills your new driver needs to work on, as well as keeps the music low until everyone, including all the passengers, are buckled. Keeping family in mind, this vehicle ensures that you and your teen driver are always driving safe. Whether you’re driving down your street or on the freeway for your daily commute, GMC wants drivers and passengers to feel safe and secure when their in the new 2019 GMC Acadia - a vehicle that keeps you vigilant and an SUV that keeps you safe. SUVs don’t have the best track record when it comes to performance, they’re known to be gas guzzlers when it comes to fuel efficiency and their bulky size means they can be hard to maneuver. But the 2019 GMC Acadia defies all of the stereotypes with an advanced AWD traction system that includes off-road, snow, sport, and trailer/tow modes, an available 3.6L 6-cylinder engine which delivers a powerful 310 horsepower and 271 lb-ft of torque, and gets an impressive 26 mpg on the highway! Whether it’s hauling a trailer in the rain or snow or driving those mountain roads for vacation, this is an SUV that has the power to get you to where you need to go. In addition, if towing and hauling is on your checklist, then the 2019 GMC Acadia can get the job done. With an incredible towing capacity of 4,000 pounds, combined with its off-road system, as well as a real-time dampening suspension which minimizes vibrations for a more controlled ride, the 2019 GMC Acadia has the performance and fuel efficiency to not break the bank. It will handle any task you may throw at it. In this day and age, drivers and passengers want to stay connected. GPS and smartphone integration are important features for any new vehicle, and those are just two of the many connectivity features the 2019 GMC Acadia has to offer - from WiFi to music to navigation, check out what this SUV includes in high tech connectivity features, you won’t be disappointed! The 2019 GMC Acadia features a number of connectivity features including Apple CarPlay, which allows you to access your favorite smartphone features including your favorite music on Spotify or iTunes, Apple Maps, and even allows you to send and receive text messages all hands-free via Siri. The 2019 GMC Acadia also features a multicolor, eight-inch touchscreen center display where you can access 4G WiFi, music, navigation, and download hundreds of in-vehicle apps. With the connectivity and capability of your smartphone, this is a vehicle that lets you stay connected at all times. Sick of being in a data deadspot? Simply connect to the built-in 4G WiFi, and not being connected is a thing of the past. If you’re looking for the latest in tech-savvy vehicles, the 2019 GMC Acadia could be the perfect vehicle for you. When you choose to buy the 2019 GMC Acadia, you’re driving a car that wants to be seen. The GMC Acadia was designed with style and sophistication in mind, and the aesthetic and sculpted exterior design of this new GMC SUV was definitely designed to be noticed. The exterior has a sleek and sculpted look, with wraparound rear glass, chrome accents, and an aerodynamic finish that gives this SUV a sports car aesthetic. The distinct GMC grille and sophisticated C-shaped headlights give it a powerful first impression. The Acadia Black Edition is an aggressive and powerful design that’s not to be missed with black exterior and interior accents that exude power and performance. With style, comfort, and capability and an exterior to match, what’s not to love about the new 2019 GMC Acadia? Get Your New SUV at Carl Black Kennesaw! Thinking of checking out the new 2019 GMC Acadia? Then be sure to visit your local GMC dealer, Carl Black Kennesaw, today! Carl Black Kennesaw has one of the best reputations in the region and there’s a reason our customers keep coming back to us - our great customer service and our vast inventory. With a convenient location, being #1 dealer in the Southeast, and a one-stop-shop for all of your car buying or service needs, we’re a dealership that has the team, service, and expertise to get you exactly what you’re looking for. With hundreds of vehicles in our inventory, we have everything from used and new vehicles to certified pre-owned. Looking to service or finance your car, give our Service Team or Financial Team a call today, they’ll be more than happy to help you! At Carl Black Kennesaw the customer comes first, and we aim to have the best service, staff, and inventory around. Whether you’re looking a new GMC SUV, or looking for a used model or a trade-in, be sure to stop by at Carl Black Kennesaw today, we’ll be more than happy to help you!